Over in Money Week, our executive editor David Stevenson recently looked at the full range of returns from investing in the fast growing P2P lending space and explored how an ordinary investor might build a ‘diversified portfolio’ of products and ideas that yielded close to 6% per annum in terms of income. Crucially he looked at the rate of income return from investing in the likes of Zopa, Ratesetter and Funding Circle and then compared it with other more mainstream options. In Crowdview this week we ask whether that expected rate of income return is actually good enough to justify the very obvious risks of investing in the space. But before we explore that theme lets remind the Crowdview reader of what those range of returns look like in practice. The table below gives the advertised headline rates on offer from a wide range of alternative finance providers. Most of the rates are ‘net rates’ after allowing for losses but the actual detailed analysis of the returns varies between platforms and needs to be treated with some caution. The length of loans varies enormously from one month (in Ratesetters case) through to five years (for most of the platforms). Put simply the longer the length of the loan, the higher the probably income yield. If you can’t be bothered to scrutinise all these yields in detail check out the chart below which shows the yields in a broad spectrum. The key number on this chart in my opinion, is the one entitled the AltFi Data LARI index which crunches masses of loans outstanding for Zopa, Ratesetter and FundingCircle. It currently shows a blended, all in return (in yield) of 5.15% pa across these platforms. Lastly a widely followed savings account called the Investec High Five deposit account (now closed, and only ever available for wealthier clients) which pays out the average of the top 5 gross interest rates from bigger banks and building societies published in the best buy tables on the Moneyfacts website and based on a three month notice account. This is currently paying 1.28% pa.
s to use another slightly more jargon based term called the estimated risk premium for investing in the sector. This simply describes the extra yield per annum you receive for investing in P2P loans. This concept of a risk premium is widely understood within the boring world of conventional investment – investors are used to the idea for instance that supposedly risk free assets like government securities (gilts) can give you around 2 to 2.5% per annum. Investors in shares (equities) by contrast can expect to receive an extra return of between 3 and 5% per annum over the long term. That return will vary enormously year by year, and will incorporate lots of ups and downs but overall shares should return 5 to 7% per annum (that 3 to 5% risk premium). But let’s be honest - this premium is needed to pay for the risks of investing in volatile stockmarkets, especially if you’re largely relying on a capital gain over a 10 to 20 year time frame. What’s the risk premium, using our headline numbers, for investing P2P loans? We use two estimates – one a real hard number, the other a very rough guestimate. The first is the return from the LARI index, currently at 5.15%. The second is our guestimate for investing beyond the three platforms tracked in the LARI – this comprises the long tail of smaller platforms that lend money to myriad different types of investor. There is no current empirical way of gauging this return from what we call The Next Tier of platforms – although the AltFi Data is feverishly working away on it – but our guess would be that annual return of around 7.5% is possible or even probable. This assumes that some platforms can self-evidently return more than 10% per annum while others (arguably less risky, and usually asset backed) return under 5%. This 7.5% number is also consistent with the estimates produced by big funds that put money to work in this space such as Eaglewood Capital’s P2P Global Investments. If we use these two benchmarks we estimate that the risk premium for lending money in this space is between 2.5% pa and 5%. The lower the yield (the LARI), the lower the probable risks but these numbers will vary hugely over time, over different interest rates and will be very dependent on how individual platforms cope with future risk. The $64 million question is whether these risk premiums (2.5% and 5%) are worth the ‘bother’ i.e is that extra yield enough to justify the risk of P2P lending given what we can reasonably expect from more boring, conventional investments? Our own take on this is two-fold. The first is that it largely depends on you, the investor, and your own needs. Many investors might need an income and that extra 2.5% return might be hugely important. For others this extra return might not be enough – they might want a much higher extra return. Empirically we’d argue that the risk premium for P2P lending should be closer to the return from investing in shares. 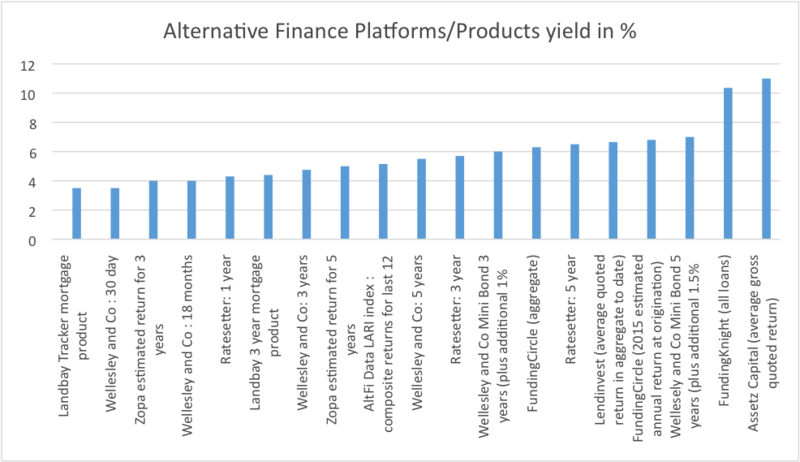 Although these alternative finance platforms are ‘lending’ businesses, we suspect their risk profile puts them much closer to the risk levels on offer from equities. We’d hope that over the longer term P2P loans should offer investors a risk premium of closer to 5% per annum, on average over the longer term. Current levels for the more established, bigger platforms strike us a little on the low side.